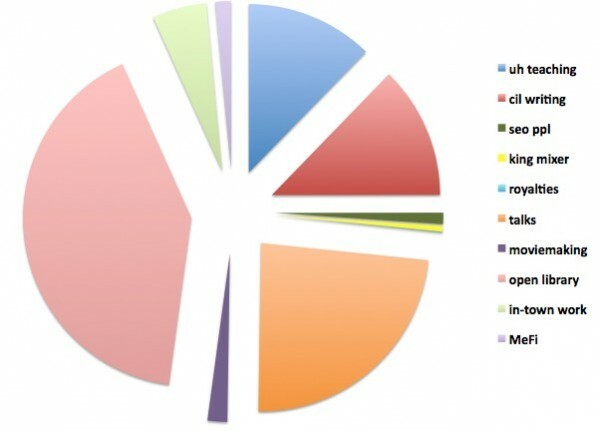 This post leaves me dissatisfied with pie chart makers and is as much a note to myself as anyone else who will read it. Last year was a weird year for work. I picked up a bunch of odd consulting projects, I left my job at Open Library, and I started teaching graduate school on an adjunct basis (and they’re having me back this year!). That big pink chunk is the part I’ll be looking to replace this year. I’m looking for a part-time, mostly telecommute job doing outreach/community work with a library or library organization, or possibly a regular writing job since I liked my last one. I’m interested in doing more teaching. I have a good solid resume which I’ll be sprucing up. I’ll continue to write for Computers in Libraries, staff drop-in time in Vermont, do public speaking and consulting, and pick up the odd consulting gig. I’ll write my labor of love newsletter which is one of the best things I started doing last year. It’s a little weird to not have One Big Job, but it’s preferable to having One Bad Job. Wish me luck and if I can help you get where you are going on some random way, do let me know.